Vintage-style papier mache boxes and containers made of pressed, unfinished cardboard that can be finished with any media including paint, glitter, papers and foil. Imported from Germany. 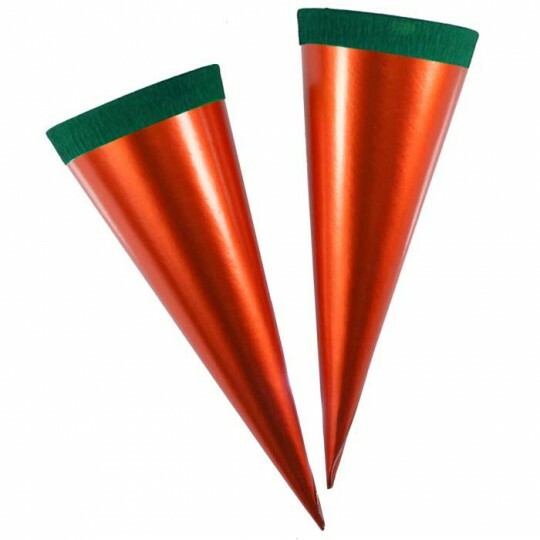 Pair of orange metallic paper cones with green crepe paper collars. Embellish with Dresden foil trims and paper scraps, or gift as is. Crepe collars arrive tucked inside cones -- pull them out, fill cones, and twist crepe to finish; or gather crepe and tie with a festive ribbon. Cones measure 5-3/4" to the top of the cone and 8" to the top of the crepe collar. Made in Germany. 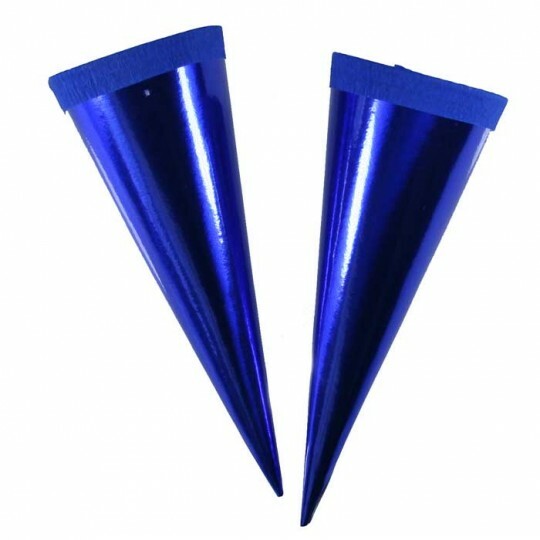 Pair of royal blue metallic paper cones with blue crepe paper collars. Embellish with Dresden foil trims and paper scraps, or gift as is. Crepe collars arrive tucked inside cones -- pull them out, fill cones, and twist crepe to finish; or gather crepe and tie with a festive ribbon. Cones measure 5" to the top of the cone and 7" to the top of the crepe collar. Made in Germany. 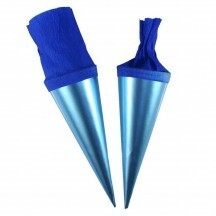 Pair of light blue metallic paper cones with dark blue crepe paper collars. Embellish with Dresden foil trims and paper scraps, or gift as is. Crepe collars arrive tucked inside cones -- pull them out, fill cones, and twist crepe to finish; or gather crepe and tie with a festive ribbon. Cones measure 5" to the top of the cone and 7" to the top of the crepe collar. Made in Germany. 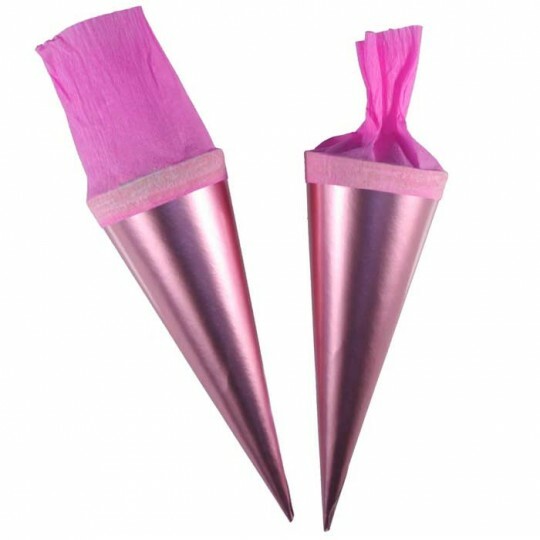 Pair of magenta pink metallic paper cones with pink crepe paper collars. Embellish with Dresden foil trims and paper scraps, or gift as is. 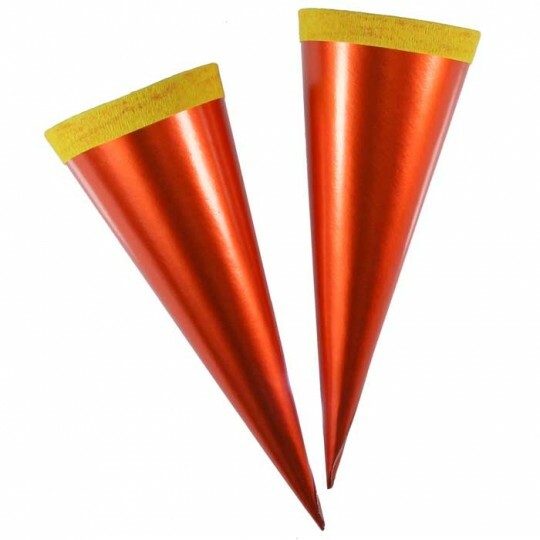 Crepe collars arrive tucked inside cones -- pull them out, fill cones, and twist crepe to finish; or gather crepe and tie with a festive ribbon. Cones measure 5" to the top of the cone and 7" to the top of the crepe collar. Made in Germany. 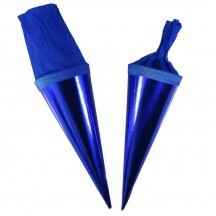 Pair of light blue metallic paper cones with dark blue crepe paper collars. Embellish with Dresden foil trims and paper scraps, or gift as is. Crepe collars arrive tucked inside cones -- pull them out, fill cones, and twist crepe to finish; or gather crepe and tie with a festive ribbon. Cones measure 5-3/4" to the top of the cone and 8" to the top of the crepe collar. Made in Germany. Pair of light pink metallic paper cones with pink crepe paper collars. Embellish with Dresden foil trims and paper scraps, or gift as is. 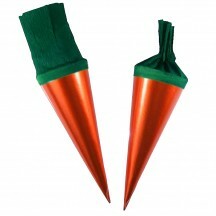 Crepe collars arrive tucked inside cones -- pull them out, fill cones, and twist crepe to finish; or gather crepe and tie with a festive ribbon. Cones measure 5-3/4" to the top of the cone and 8" to the top of the crepe collar. Made in Germany. 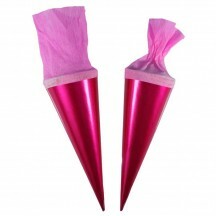 Pair of magenta pink metallic paper cones with pink crepe paper collars. Embellish with Dresden foil trims and paper scraps, or gift as is. Crepe collars arrive tucked inside cones -- pull them out, fill cones, and twist crepe to finish; or gather crepe and tie with a festive ribbon. Cones measure 5-3/4" to the top of the cone and 8" to the top of the crepe collar. Made in Germany. 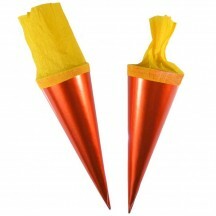 Pair of orange metallic paper cones with yellow crepe paper collars. Embellish with Dresden foil trims and paper scraps, or gift as is. Crepe collars arrive tucked inside cones -- pull them out, fill cones, and twist crepe to finish; or gather crepe and tie with a festive ribbon. Cones measure 5-3/4" to the top of the cone and 8" to the top of the crepe collar. Made in Germany. 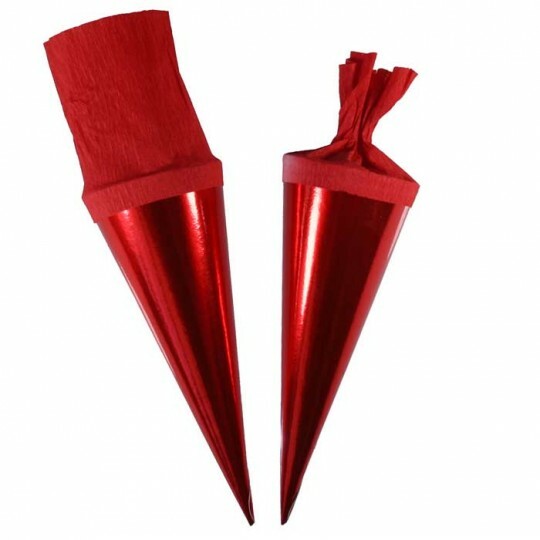 Pair of red metallic paper cones with red crepe paper collars. Embellish with Dresden foil trims and paper scraps, or gift as is. Crepe collars arrive tucked inside cones -- pull them out, fill cones, and twist crepe to finish; or gather crepe and tie with a festive ribbon. Cones measure 5-3/4" to the top of the cone and 8" to the top of the crepe collar. Made in Germany. 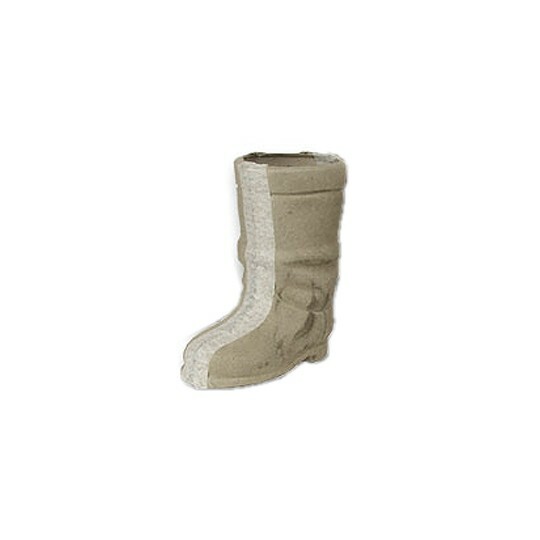 Papier-mâché cardboard Santa boot measures 2-3/4" tall. Made of pressed, unfinished cardboard, this Karton container can be finished using any media, including paints, glitter, or foils. Made in Germany. Papier-mâché cardboard ball box measures 3" across. 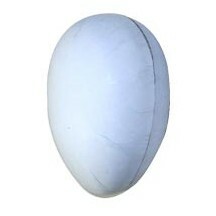 Made of pressed, white cardboard, this Karton container opens and closes easily with a tight seal. Can be finished using any media, including paints, glitter, or foils. 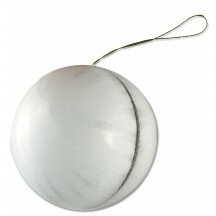 Has a gold cord for hanging. Made in Germany. 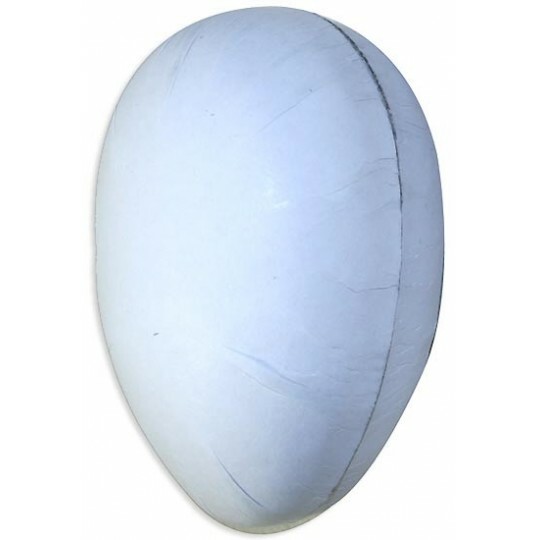 Unfinished white DIY papier mache egg container in matte white has different line images on both sides of a bunny with eggs. 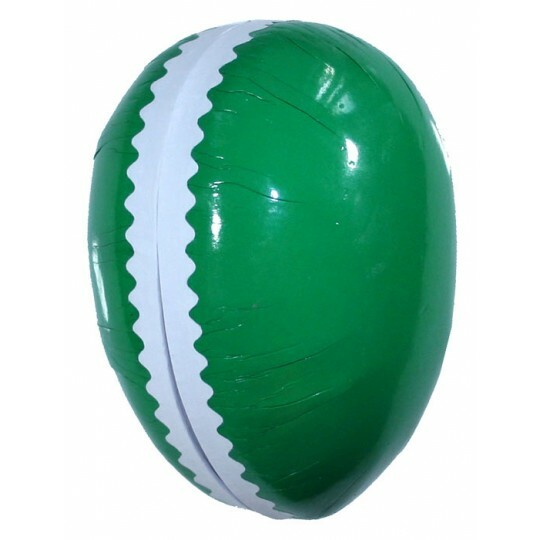 Inside of egg has a green floral print. Measures 6" long, 3-3/4" across and 3-3/4" high. Imported from Sweden. 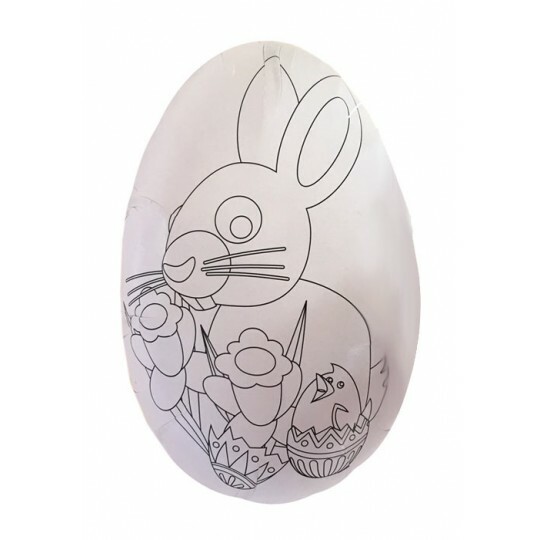 Eggs can be decorated with colorfast marking pens, acrylic paint and glitter. 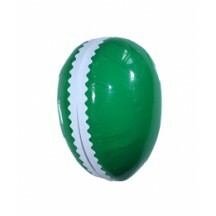 Papier mache egg container in glossy green with scalloped white trim. Perfect for candies or other small treats, halves fit snugly together. Made in Germany. Measures 4 1/2" long, 3" across and 3" high. This container is perfect for decorating with scraps and dresden trims. 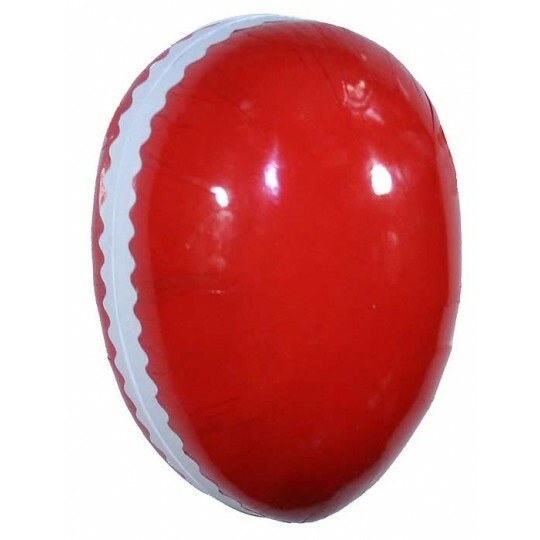 Papier mache egg container in glossy red with scalloped white trim. 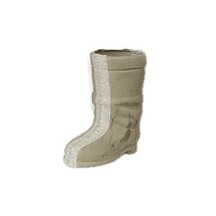 Perfect for candies or other small treats, halves fit snugly together. Made in Germany. Measures 4 1/2" long, 3" across and 3" high. This container is perfect for decotaring with scraps and dresden trims.